Hit the gas: go green! Found a USB stick? Go and infect your PC! Ombuds’ corner: Do not put things under the rug! Just one year ago, CERN took delivery of its first bi-fuel vehicles (see article in Bulletin 07-08/2011). Today, the fleet comprises 100 vehicles capable of running with petrol or natural gas. At that time, Véronique Marchal, head of the Site Services section in the GS Department, told us: “We are counting on CERN car users’ environmental awareness to use natural gas fuel whenever possible.” Observations one year later show that... well, let’s say there is still plenty of room for improvement. A new awareness campaign has therefore been launched. “Running on natural gas reduces carbon dioxide emissions by some 40%,” explains Serge Micallef of the Services Industriels de Genève (SIG), CERN’s partners for this green mobility project. CNG contains 20% biogas, which is carbon-neutral. CNG produces 60 to 95% less pollution overall than ordinary petrol, and it is entirely soot-free. It is true that filling up with gas requires a short drive to the BP station along the Route du Nant d'Avril, while petrol is available right on the CERN site. Still, it should be borne in mind that the BP station was equipped for gas specifically to cover CERN's needs, and its capacity was dimensioned accordingly. The fuel badge is easy to use compared with other ways of paying. “We negotiated and set up a partnership with the BP station to simplify the payment procedure. It’s also a matter of economics, because it would cost hundreds of thousands of Swiss francs to install a CNG filling station at CERN today,” concludes Isabelle Mardirossian, head of the Integrated Services Group in the GS Department. 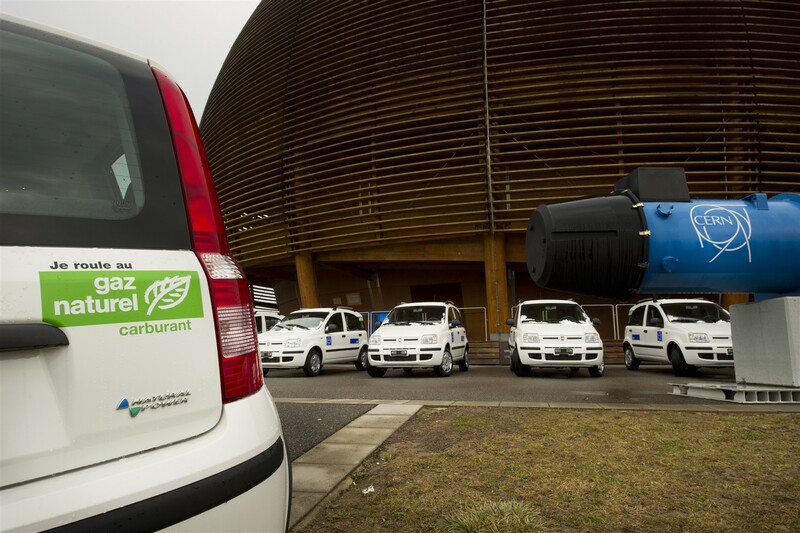 CERN’s decision to make bi-fuel vehicles available to its users is part of its policy of respecting the environment, as befits any major organisation today. Everyone's help will be needed if this venture with 100 vehicles, the first corporate fleet of its type in Suisse romande, is to be a success. The SIG will set up a stand at the entrance to Restaurant 1 where you can get answers to your questions and any other information you may need about how the CNG vehicles work and how best to use them. The stand will be open from Monday, 20 February to Friday, 24 February between 9.30 a.m. and 2.30 p.m.